It’s an issue that has to be addressed by any city or town: what to do with sludge from sewage once it’s been through the waste treatment plant. Renda Environmental Inc. (REI) has an efficient and useful solution for Fort Worth, Texas, and it involves Mack® trucks. 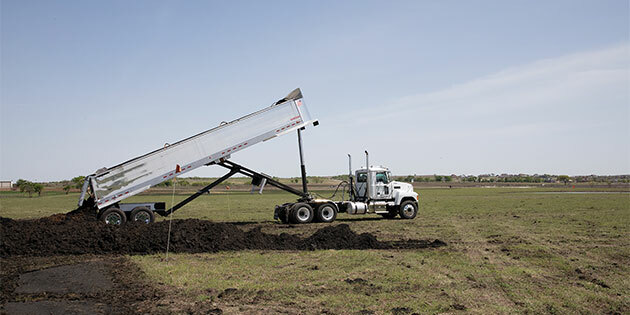 The Fort Worth-based company provides environ­mentally sound solutions for managing wastewater byproducts, and it runs an all-Mack fleet — including nearly a dozen Mack® Pinnacle™ Axle Forward Day Cabs with mDRIVE™ transmission — to deliver biosolids to North Texas landowners looking to boost crop yield. REI removes the water from from the sludge and sells the remaining organic matter as fertilizer and soil conditioner. “We use technology and chemistry to isolate the residuals and extract the nutrients,” explains Ben Davis, REI environmental program manager. “The nutrients in the material are nitrogen and phosphorus; the micronutrients are boron, manganese, copper and zinc. Oscar Renda founded Oscar Renda Contracting in 1974. In 1992, the company ventured into residuals management projects. REI operated as part of that contracting business until 2003, when it became a separate entity. At that time, REI employed 40 people and owned five trucks. Today, it has 55 employees and runs 36 trucks. Revenue has tripled in that time, making REI the largest Class A/B biosolids land applier in Texas. Oscar’s wife, Raquel Renda, is the fleet manager and has put her stamp on the ­operation. It’s well-known that manpower — specifically a shortage of good drivers — is among the top problems plaguing the industry. Attracting and keeping quality drivers is the lifeblood of any trucking company. That challenge for REI is amplified by long days that demand drivers do more physical work than the average trucker. REI drivers start their days early, often arriving at the Fort Worth dewatering facility before dawn. Indoors at the facility, six belt-filter presses operate day and night to extract water from ­liquid sludge piped in from the city’s wastewater treatment plant next door. Removing the water from the sludge leaves a dense black cake, which REI then treats with lime so that the solids are compliant for land application and odor potential is minimized. Odor is a big deal in this business, especially since trucks must frequently travel through populated areas on the way to customers. Once the dewatered cake rolls off the belts, a conveyor carries it out of the building and deposits it in piles that can be loaded into empty trailers. Recently, REI purchased 10 new Pinnacles with mDRIVE automated transmissions. When Raquel first let her drivers know that she planned to replace the manual 13-speed transmission trucks with trucks with the mDRIVE, there was a natural resistance. Not everyone likes change, and many seasoned drivers feel that manually shifting gears is an important part of the job. To overcome objections from her crew, she turned to her Mack dealer, Bruckner’s Fort Worth, and her sales rep, Butch Mask. The relationship between Oscar Renda and Bruckner’s in Fort Worth goes back 30 years, when Mask sold Oscar his first truck. Mask felt confident that once REI drivers got a shot in the seat of a truck with the mDRIVE, they would not only see why the switch makes good sense, but also embrace a change that would ease their burden just a bit. “As we all know, experienced drivers are not around every corner, and these guys don’t want to be told how to shift,” Mask says. “Raquel asked me to bring a demo out and let the drivers drive it. So one morning, that’s what I did. We loaded up three loads and took them up to farms around Venus, Texas. “Those drivers were scared they would get stuck, scared they wouldn’t be able to get moving. When we left out of there, one of the ­manual 13-speed trucks was following us. We were just driving normally, but we ran off and left that other truck. Simply put, a driver can’t shift as fast as the mDRIVE puts him in the gear he needs to move down the road — not to mention that it keeps his hands free to hold onto the steering wheel,” Mask says. After the demo, every one of the REI drivers agreed: mDRIVE is way to go. “When they first got in the trucks, they felt lost,” Raquel says. “To get used to that new technology was a transition, but after a week, they didn’t want anything else.” And Raquel is committed to converting the rest of her fleet to mDRIVE. The happiness and well-being of REI’s drivers is extremely important to Raquel. She’s so committed to treating them like family that they call her “Mamma Renda.” But her focus on relationships extends beyond the people on her payroll. She and her team have built strong professional connections all along the supply chain, from the municipalities whose water they receive to the farmers and ranchers to whom they deliver biosolids. She sees REI as a steward of both the communities it serves and the land it helps replenish.